The Ohio Valley Conference recently did a blog on streaks in the OVC, so with the EIU women's basketball team on a pretty good streak of its own we thought it would be fair to give a look at some other streaks in EIU sports history. Now back to the current streak by the EIU women's basketball team. The Panthers enter their game against UT Martin on Feb. 18 with a 13 game win streak. That number ranks them seventh in the nation behind such names as UConn, Nebraska and Stanford. Speaking of Nebraska that is the team ESPN.com's latest Bracketology has the Panthers lined up to play in the NCAA Tournament. EIU needs just two wins in its final four games to win the OVC regular-season title. A regular-season championship would assure the Panthers of a post-season game (catch- the NIT would take the Panthers as the OVC champion should they not win the OVC tourney). 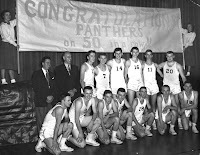 A post-season appearance would be the first for the Panthers since the 1988 season when they made their only NCAA Tournament appearance hosting Colorado in the first round in Lantz Arena.